On January 20, 2016, Councilor Ken Sanchez and the Albuquerque City Council were honored to present a proclamation to District Judge Jacqueline Flores, Pre-Trial Services officer Anthony Rodolfo, and Dr. Lester Brasher of Albuquerque Behavioral Health, as well as prosecutors, defense attorneys and local law enforcement for work and efforts through the Second Judicial District Court’s Felony DWI program. The DWI program helps participants of the program improve their lives and make Albuquerque streets safer by removing repeat drunken driving offenders. The program was recently awarded a federal grant from the US Department of Justice for $279,919 to expand operations and double the number of clients served by the program from 30 to 60. Costs average $7.03 per client per day in the DWI court program, compared to $92.90 a day for incarceration. City Councilor Ken Sanchez was honored to accept the invitation to attended a DWI Court graduation ceremony for 5 graduates in December of 2015 and be part of such a big step in these individual’s lives. Albuquerque Journal article on the program. 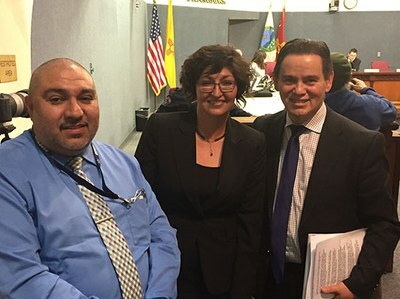 Anthony Rodolfo, left, and Judge Jacqueline Flores, center, are joined by City Councilor Ken Sanchez during the council meeting on January 20, 2016.